The emulator system can be configured to use the standard connection for communicating debug and programming instructions to the target. This 6-pin connection is the same one used by other Microchip in-circuit debuggers. A matching socket at the target, where the target device (or device-specific plug-in module) is on the target board, as shown in Figure 1. 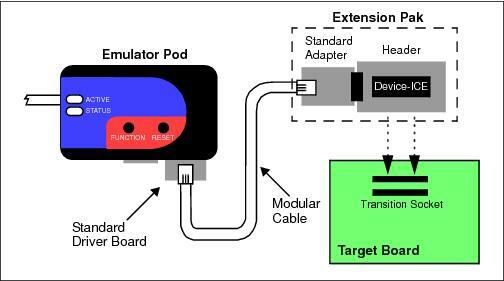 A standard adapter/header combo – available as an Extension Pak – which is then plugged into the target board, as shown in Figure 2. Older debug headers used a 6-pin (RJ-11) connector instead of an 8-pin connector, so these headers may be connected directly to the emulator. To see the debug features of a device versus those of a header, see Hardware Tool Debug Features by Device. For more on the hardware, see Standard Communication Hardware. To use the standard driver board, the MPLAB REAL ICE in-circuit emulator is connected to the target device with the modular interface (six-conductor) cable. The pin numbering for the connector is shown from the perspective of the bottom of the target PCB in Figure 3. Cable connections at the emulator and the target are mirror images of each other; i.e., pin 1 on one end of the cable is connected to pin 6 on the other end of the cable. See Modular Cable Specification.